If you are doing any kind of self-defense training, then you are certainly aware of the term OPSEC ... Operational Security. There are several implementations of OPSEC, including keeping valuable information from your adversary, but I want to consider a specific application of this strategy. 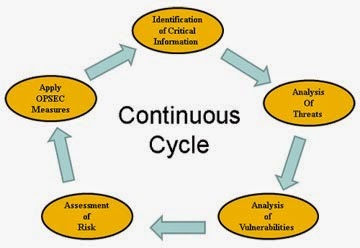 Very simplistically, as a military term, it means identifying critical information to determine if further action is needed to protect the mission or to stop a threat. But it is easily applied to civilian life as well. If I'm exiting a mall late at night, am I employing a process of protecting little pieces of information that could be grouped together to give me a bigger picture? Am I alert and off the phone, so my eyes are scanning the immediate area for any threats? Is there a van parked next to my car? Is there anyone hovering in the area between me and my destination? How is the lighting in the parking light? Do I have a method to defend myself, and is it readily available? Is it worth the risk of trying to make it to my car, or am I better off seeking assistance from mall security? There are many other questions that will provide me with critical data to protect myself, if need be. In short, Operational Security requires Awareness, Assessment and Action. You can see how important it is to personal safety, and many Americans are taking the steps to be more vigilant and alert in terms of defending themselves. Yet, why haven't we done the same thing when it comes to defending our country? The same elements apply. We need to take our eyes off our phones, iPads and computers and look around us --- we have failed to identify the threats to our nation and way of life. And now that we are waking up to just how much devastation has been done to our national foundation, how many of us are taking the time to seriously analyze the threats and vulnerabilities that still exist, and forming a plan to recover our national character and distinctiveness? And what will your part be? Because I can tell you that if we stand a chance of defending America or returning her to even a small vestige of her glory, we are all going to have to do our part ... it has to be accomplished by more than the guys/gals who wear the uniform; whether combat veteran or law enforcement. We all need to take responsibility for what this nation has become! We fell asleep on the watch, became obsessed with our cell phones, and relegated the OPSEC to someone else. It may be too late ... we may be too far down the rabbit hole to ever return to who we were. This much I know for sure ... I can identify where we're off balance and out of sync. We have neglected our education, training, mindset, and morals, and now everything is out of alignment. We don't run straight or true to ourselves. These 4 things are the pieces of the puzzle, that when fit together, give us the bigger picture of who we were. But since we didn't protect them, our OPSEC has left us vulnerable, and put our future in jeopardy. We were supposed to defend our country with each of those pieces of the pie. Our military has done a tremendous job of keeping us safe and secure. But I'm afraid that the foundation upon which they stand is rotting, and our failure to attend to our essential duties of guarding America has left us all in a perilous and deteriorating state. As a Believer, I am all too aware that nothing is accomplished on our own. For 200 years, God Almighty kept His protecting hand on this land; on a nation that recognized we had a unique relationship with a Creator who bestowed Life, Liberty and the Pursuit of Happiness upon this blessed republic. But the last few decades have shown that we failed to recognize the slow disintegration of that relationship -- we weren't aware it was slipping away, we didn't assess the damage that would do to our culture, our society, or our government; and we didn't take the proper action to curb the encroaching decay. Now we will pay the price, and it is a costly one. I'm not one to ever give up; I know that all things are possible; and I believe in miracles. I'm willing to do my part and with a renewed vigor to protect, not only all those pieces of the pie, but to take my place in providing Operational Security for my country. I have been born for this time and for a purpose. It is not to stand with downcast eyes on the latest technological marvel, but to scan my immediate environment and the horizon in order to thwart further perils upon this nation and its people. But above all else, I will be looking up and praying that God hears my voice as I ask for forgiveness for my part in the deterioration of the land He established. I promise that my OPSEC will be solid, steady and unyielding. Will you? 1 Corinthians 16:13 "Remain alert. Keep standing firm in your faith. Keep on being courageous and strong."